Augmented Battlefield is an augmented reality strategy wargame where two teams battle in a three dimensional surface created by the users with everyday life objects. 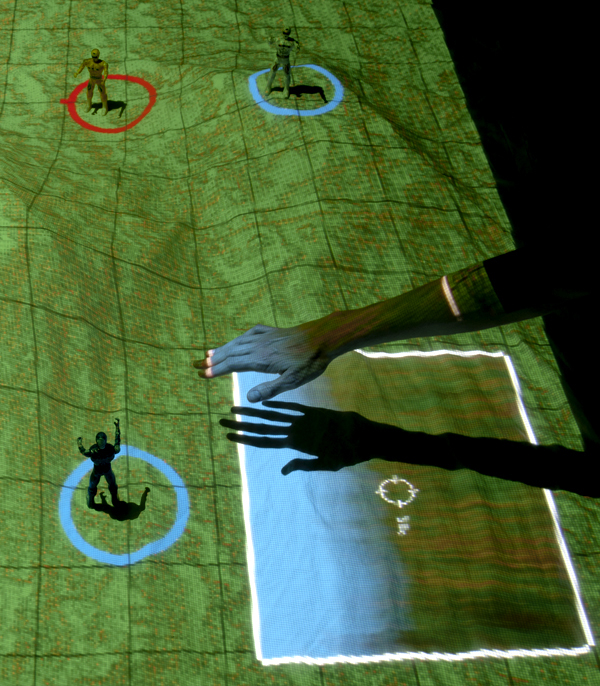 This battlefield is augmented by projection-mapping the 3D scanned surface and the User Interface onto it. This is the first prototype, check here a newer version. A virtual 3D representation of the terrain is created as well, making possible to see the battlefield from the real world avatar’s point of view,where you can target and shoot your enemies, but this shoot will fly and explode over the actual terrain and figures! Mech Battlefield is a new kind of game, it borrows the structure and elements from board games, like figures and landscape scenery, and turns them into a physical video game, targeting and shooting from a first person computer generated view.